The Hanna HI736 Phosphorus Ultra Low Range (0 to 200 ppb) Checker® bridges the gap between simple chemical test kits and professional instrumentation. Chemical test kits have limited accuracy and resolution since they rely upon the human eye to discern differences in color. Professional instrumentation incorporates a light source such as an LED or tungsten lamp with a filter and a light sensing detector to precisely determine ion concentration. Professional instrumentation offers greater resolution and accuracy but can cost hundreds of dollars. 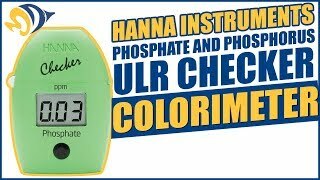 The Hanna Phosphorus Ultra Low Range Checker® uses a fixed wavelength LED and silicon photo detector to provide the accuracy of professional instrumentation at the affordable price of a chemical test kit. Phosphorus is an essential element for all life forms. While phosphorus is vital for growth in plants and animals, it can be problematic for aquaria inhabitants, especially for coral, where excess phosphorus can even prevent calcification of coral from occurring. The main source of phosphorus in reef aquaria is through food. Phosphorus is an important part of any fish food, but much care is taken by reefers to avoid overfeeding. 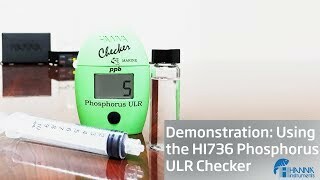 The Hanna Marine Ultra Low Phosphorus Checker® HC HI736 is designed to make testing quick and easy. Press the button. Once the screen shows Add C2, remove the cuvette from the meter and add one packet of HI736-25 reagent. Fasten the cap, and shake gently for 2 minutes until the powder is completely dissolved. Then wipe the cuvette of any oils and fingerprints, and place back into the meter. Press and hold the button until the timer is displayed on the screen. The 3-minute countdown will begin. 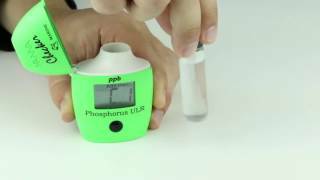 Once the timer reaches zero, the meter will directly display the concentration of phosphorus in ppb. My biggest regret is not purchasing one of these when I started my reef adventures. Don't wait. Just do it. After several month of using this product, I can safely say that it is accurate every time is use it and it tells me exact levels of phosphates inside my aquarium. This colorimeter is hands down the most sensitive and most accurate hobbyist device for measuring phosphorus, at least at low levels. For example, it will give me a reading of 7 when a corresponding sample sent to Triton Labs comes back as 6. Hanna's very similar phosphate colorimeter for some reason is not quite as sensitive, sometimes reading zero when there is actually a very small amount of phosphate present. Aside: This device measures phosphorus in ppb. A rough conversion to the phosphate we're mostly more familiar with is easy to do in your head. Multiply by 3 and move the decimal point 3 places. So, a phosphorus reading of 10 is a phosphate of .03, a reading of 20 is phosphate .06, and so on. Unfortunately some features of this device seem designed for people to fail to perform the test properly, requiring repeat with use of more reagents (Hanna is stingy with reagents in general). Here are my tips for doing the test correctly every single time. 1. Open the reagent packet first. Tamp it down, tear across the mid portion, then open one seam. You've made a little dispenser out of it. Put it aside. 2. (Optional) Buy some small plastic perfume funnels off Amazon. They will let you quickly pour the powdery reagent into the small mouth of the test cuvette, ensuring that none is lost. They are also useful for some other Hanna colorimeters. 3. Make sure there are NO tiny bubbles on the inside of the test cuvette, or smudges on the outside, any time it goes inside the colorimeter. 4. After doing the blank, remove the cuvette and add the reagent (with the funnel) promptly. Cap it and shake it fairly vigorously for 90 seconds, not 2 minutes as the instructions say. Make sure there is no floating particulate matter visible when you put it back in the device. I dose lanthanum chloride for phosphate removal and need a test that shows a detailed result, this is the kit that delivers! One of the best purchases I've made for my tank. Pretty easy to use. Some make a fuss about getting the powder into the vile. I pour the water into the packet and allow the powder to dissolve. Then i pour it into the vile. That way all of the powder is used. Gives an accurate reading. Quick and easy checker. Helps me monitor phosphorus in my reef tank. Give me a better reading than just the phosphate checker.